I thought I was bummed two Aprils ago, when I found out I'm allergic to pears. Saturday's discovery that I'm allergic to bee stings is indescribably… I don't know what word to use. The whole bit about going to the E.R. isn't that big a deal to me, the event being so surreal. It's the giving up of my bees that I find difficult to accept. But even before being discharged, we knew who we were going to call. One of the wonderful things about being a beekeeper is that you meet really great people. The Warré hive is going to be cared for by John the Beekeeper and his family. 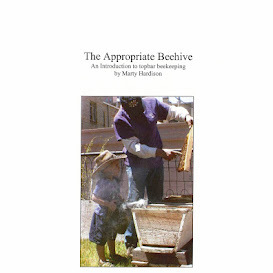 You can read about John's Bees on his website. I think you'll agree that the bees will be well-cared for. The Top Bar Hive is still inside the greenhouse. It will be safer for Marty and BB to move it after the blizzard is over, so it'll be a few more days before I can be in The Backyard again. It's going to seem empty and depressing, but I'm anxious to check on the mason bees.